Mexico City is the capital city of Mexico. It's also the largest city in North America. It has a rich culture, an impressive art scene, and a very active nightlife, which attracts travelers from around the world. 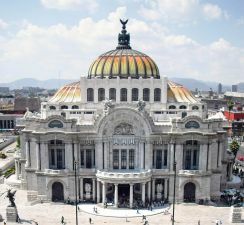 Although Mexico City is more expensive than most cities in Mexico, it is still more affordable than most large European or North American cities. There are a variety of hostels in Mexico City that you can choose from. They are as diverse and interesting as the city itself, and many offer a fun and social environment. How much do hostels in Mexico City cost? A good hostel for solo travellers, couples, families, females travellers, and small groups. Suites DF Hostel is located very close to Mexico City's downtown area. It's also conveniently close to pubic transportation and many of the different tourist sights in the area. It's just two blocks from Monumento a la Revolucion and Av. Reforma. The hostel offers a variety of room types and amenities for guests. Breakfast is available every day. The staff is also very knowledgeable on the area and can help with any tours or activities that you might want to arrange. Room types include a private family room that is perfect for a family of four or a small group of friends traveling together. There are also twins, doubles, and triple rooms available. Dorms include male only, female only, and co-ed dorms. All dorms sleep up to six people. Hostel Home is another popular hostel in Mexico City. It's located in the middle of the historic Roma and Condesa neighborhoods and the building has a lot of charm. The hostel is popular with a diverse crowd of international travelers. The staff are friendly and helpful, and they can help you appreciate the rich culture and art scene around the city. This is also a nice hostel if you want to relax and hang out with fellow travelers. If you're looking for a mellow atmosphere where guests are often hanging out and swapping travel stories, then this is the place to come. Whether you're starting your trip to Mexico or ending it, you'll definitely enjoy and benefit from the conversations you'll have here. The hostel has both private rooms that are doubles, and dorms that sleep five, six, or eight. Five bed dorms are female only. This hostel is located in a charming 19th century building that is just a block from the Templo Mayor and Zocalo Downtown areas. The hostel can sleep up to 52 people in a range of room types. There are three, four, five, and six bed dorms as well as single and double private rooms available. Most rooms have their own private bathroom. The hostel has a variety of amenities available to guests. A simple breakfast is included in the price of the room. There are also board games and a book exchange if you want to spend some time relaxing in the hostel. Free wi-fi is also available throughout. Although there is not a full kitchen, guests have access to a microwave and refridgerator that they can use to prepare simple meals or snacks. The Hostel is a friendly and fun place to stay with a laid back group of people. If you want to be close to everything but not break the bank, then this is the place to come. Mexico City Hostel is another favorite option for travelers to Mexico City. It's one of the most affordable places to stay in the city and it has modern comforts and conveniences. The hostel is just steps from the Cathedral and the main square, Zocalo. It's also very close to galleries, shops, markets, and museums. You can choose between private rooms or dormitories. Single and twin private rooms are available. Dorms are also diverse. If you want a quiet space that is less crowded, there are four or six bed dorms available. If you want to save a little more money, there are eight and twelve bed dorms available. Some of the eight bed dorms are female only. This hostel is a great option if you want affordability in a good location. The atmosphere is also fun and the staff are friendly and helpful.